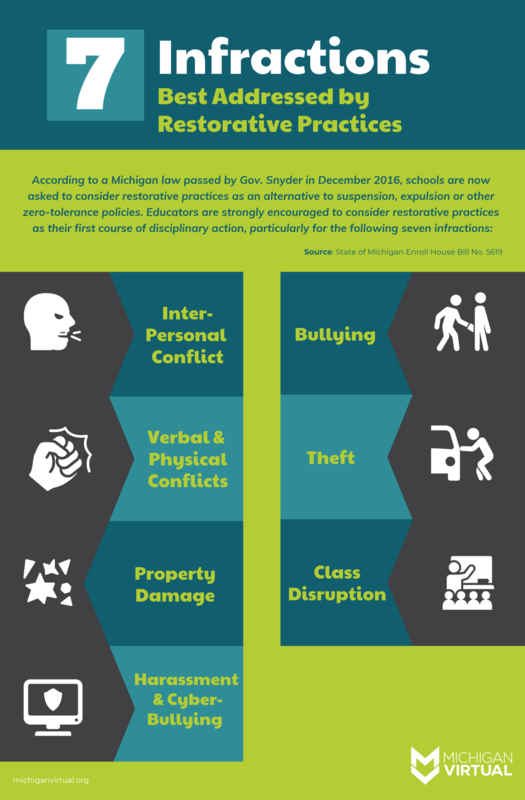 Michigan’s new law on restorative justice has put pressure on schools to rethink their school discipline programs. From the district level to individual classrooms, educators are being asked to follow a new set of guidelines when it comes to disciplining students who violate school policies. This law does not say that schools can never suspend or expel a student for deviant behavior. It simply asks them to be more intentional about who they are submitting to zero tolerance policies and why. Would a lesser intervention than suspension or expulsion appropriately address this behavior? If the answer is yes, then schools ought to first turn to restorative practices. If the answer is no, they still have the right to suspend or expel a student, so long as they can justify this response. More serious crimes — such as bringing a firearm to school — are still grounds for automatic expulsion. What we’re seeing here isn’t zero tolerance against zero tolerance policies, but rather, a push away from our ineffective and harmful history of removing students in need from schools and toward a system with more positive and long-lasting effects. Subscribe to our blog to receive notifications when these blogs are released, and we’ll send a copy straight to your inbox.